Have you ever found yourself writing an email (or a blog post!) and wished you could just show what you mean instead of having to try to describe it? We often find that being able to quickly capture what’s happening on a computer screen is invaluable for saving time and communicating more clearly. There are a few neat tools from a company called Techsmith that we use all the time! Sure, you can press the Print Screen button on your keyboard, open an image editor, paste, crop, edit, save…but aren’t there better tools? There are fewer options when it comes to recording an actual video of what’s happening on your computer screen, but Camtasia Studio (also made by Techsmith) is terrific. Techsmith also makes a completely free tool called Jing that’s not as full-featured as it’s commercial products, but is really fast and easy to use. WPI staff and faculty can obtain SnagIt or Camtasia through our campus license agreement. WPI students can use SnagIt or Camtasia on any WPI classroom or lab computer. We use the Techsmith products because they are fast, intuitive, and work really well. But here are some alternative ways to capture images and video on your computer. Just a quick note–we’re aware of the stuff below, but these aren’t the tools we use every day, so we’re probably not the best to talk about them! The Print Screen key on Windows keyboards captures the whole screen, Alt+Print Screen captures just the active window. The image goes to the clipboard and needs to be pasted elsewhere. 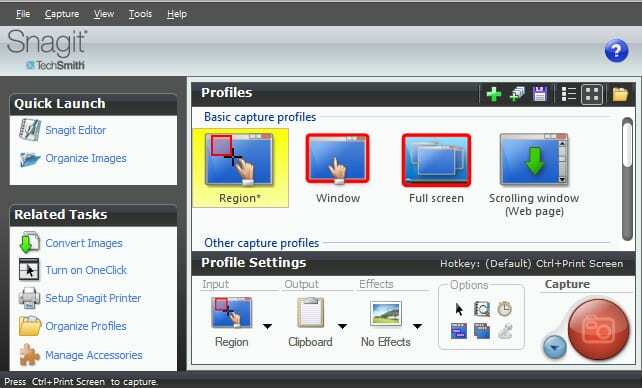 Search for the “Snipping Tool” in Windows Vista or later for a lightweight tool that captures the whole screen or a selectable region and allows you to save to either an image file or the clipboard. On a Mac, press Apple key ⌘ + Shift + 3 and then click to capture the full screen, Apple key ⌘ + Shift + 4 to select and capture a region, and Apple key ⌘ + Shift + 4, then spacebar to capture a specific window. Try out CamStudio on Windows (free) if you only need to record your screen (no editing, online sharing, export to web formats. What did we miss? What do you use? Let us know! Definitely helpful. I have been using this tool for projects at the CDC. Thanks!